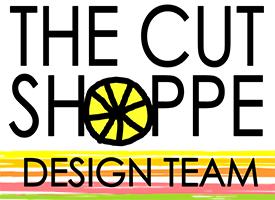 Paper Gumbo: Yours Truly Blog Hop! Who knew I could have so much fun with a Valentine's theme paper pack?! I generally don't take cutesy kid pictures since most of my "kids" are grown and the youngest three are boys at that! However, with the truly versatile papers in this collection, created by the talented Cassandra Cooper, I was able to put together a football page and a travel page, as well as the typical Valentines themed layout. Fun stuff! Black and white houndstooth...oh my! This particular pattern caught my eye immediately, and drove me to create a more non-traditional layout with these papers...a football page! The houndstooth tradition at the University of Alabama began with legendary Bama football coach "Bear" Bryant and his houndstooth patterned hats. Today you can find fans with houndstooth coats, gloves, scarves, purses, ties, and all other manner of clothing and accessories! I had baked football-shaped cookies for our houseguests, my son's fraternity friends, who were camping out in our family room before the big game. After Alabama's convincing win over LSU, I took a picture of the cookies, knowing that I'd need to scrap such a momentous occasion even if I didn't have a single picture of the game or the tailgating that the boys had experienced. 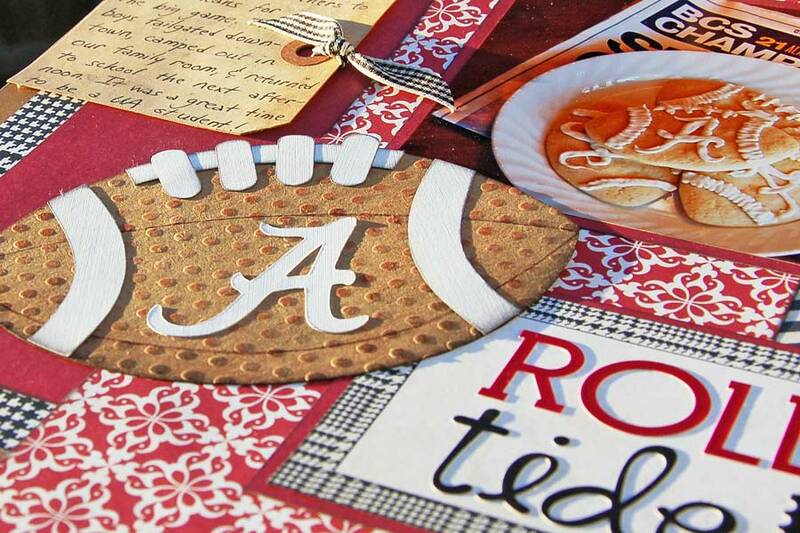 The kraft color was a perfect backdrop for the red, black and white (Crimson Tide colors BTW!) My page is based on Sketch #65 from Susan Stringfellow's Sketch Savvy Blog. I love those oversized ribbonlike strips! A pieced football was created using kraft paper that was then embossed and inked for more of a pigskin look. 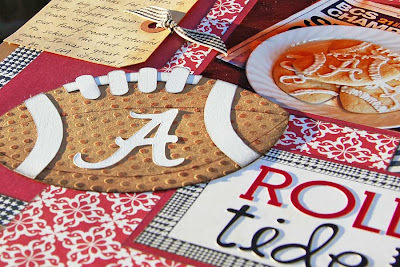 I also had the opportunity to use my newly acquired die cutting machine, giving me a perfect Alabama "A"! 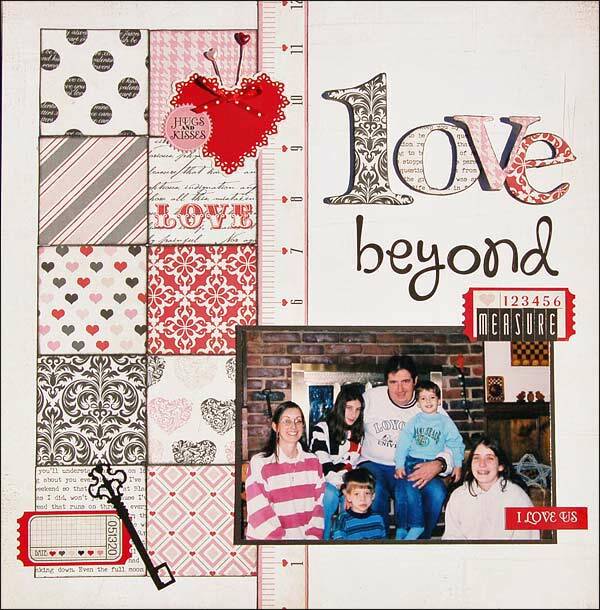 The title Love Beyond Measure was borrowed from one of the die cut stickers as I thought the saying paired well with the ruler border strip! 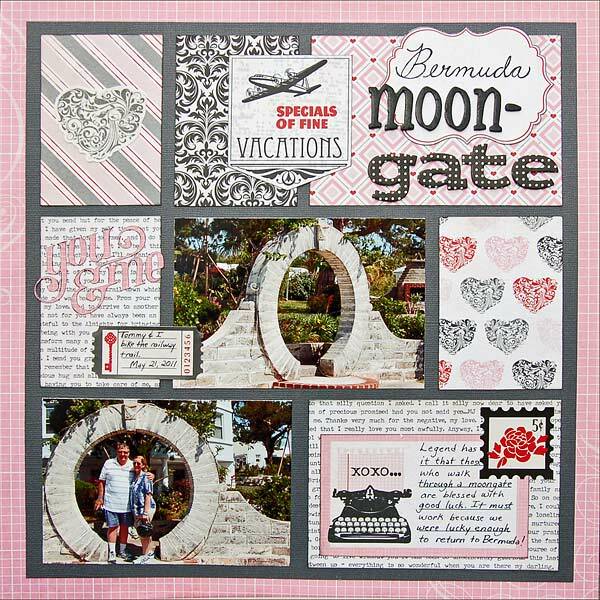 I punched some squares and covered some old chipboard letters with various patterns to create this fun and easy page. I'll add more links as they go live! All these are gorgeous Madeline but you knew the Alabama one would catch my eye! Beautiful pages, Madeline...and each so different. 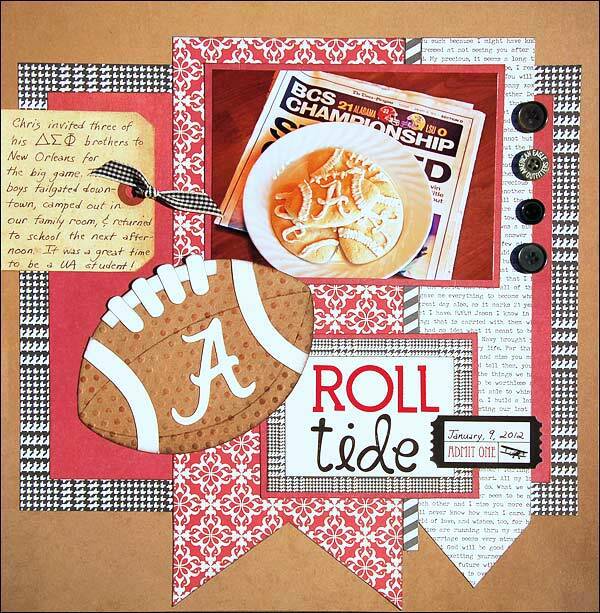 Love the versatility you've shown with these papers! GREAT pages, Madeline! And excellent thinking outside the box, using Valentine papers for a football page....I never would have even thought about that! !